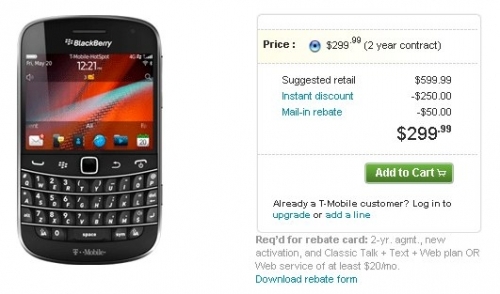 BlackBerry 9900 available now at T-Mobile | BlackBerry Blast! The BlackBerry Bold 9900 is now available at T-Mobile. After being released on Sprint about a week ago, it finally made it over to T-Mobile. With a suggested retail price of $599, T-Mobile is proud of these BlackBerrys. The subsidized price is $299.99 on a 2 year contract AFTER a $50 mail-in rebate. That means you'll have to cough up $349.99 to pick one of these up, and then wait for your $50 in the mail.